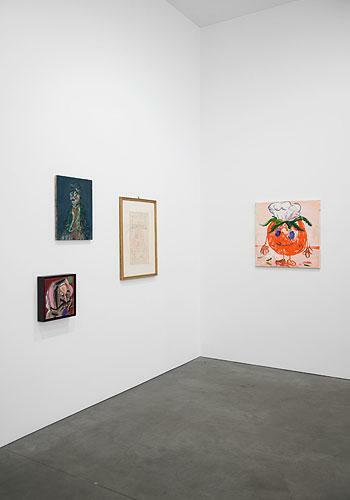 © Sean Landers, Courtesy Andrea Rosen Gallery, New York; © 2010 Estate of Pablo Picasso/Artists Rights Society (ARS), New York, Courtesy Leslie Sacks Fine Art, Los Angeles; © Ansel Krut, Courtesy the artist and Stuart Shave/Modern Art, London; © Manuel Ocampo, Courtesy the artist; © Nigel Cooke, Courtesy Stuart Shave/Modern Art, London, and Andrea Rosen Gallery, New York; © Armen Eloyan, Courtesy Timothy Taylor Gallery, London; © Neil Hedger, Courtesy the artist; © Paul Housley, Courtesy the artist; © The Estate of George Grosz, Princeton, New Jersey; © The Estate of R.B. 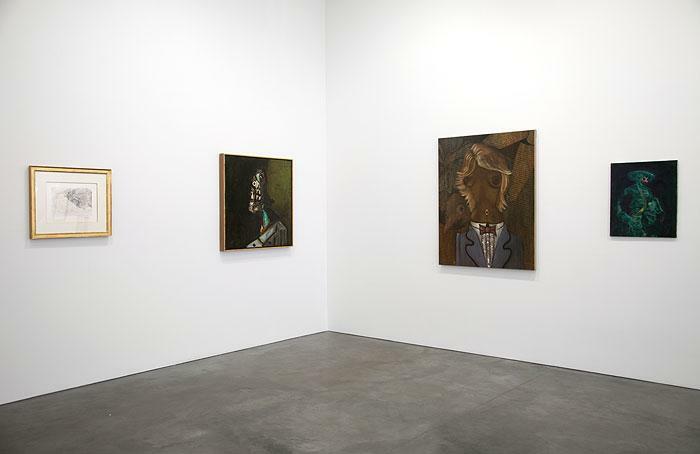 Kitaj, Courtesy Marlborough Gallery, New York; © 2010 C. Herscovici, Brussels/Artists Rights Society (ARS), New York, Courtesy Galerie Brachot, Brussels; © George Condo, Courtesy the artist and Luhring Augustine, New York. "She Awoke With A Jerk" is the title of a song by the husband and wife alt-country duo The Handsome Family, from their first album Odessa. The title can be clearly read in two ways – it evokes a woman suddenly jolted awake, the melodrama recalling the style of a suspense novel. At the same time it suggests a woman awaking to find herself in bed with a moron, an idiot, a feckless buffoon. With the force of an epiphany, a woman awakes to the shock that she has somehow been saddled with a jerk. The duality of this phrase mirrors the theme, tone and identity of this exhibition. The 'Jerk' who confronts the female gaze on awakening is right here – all the artists are male, for a start, the history of which has no shortage of jerks acting up in the name of creativity. In all the works on view in the show, the heritage of the swaggering male artistic genius is ingloriously handed back, in the process twisting the heroism of art making into a doubtful and wretched farce. 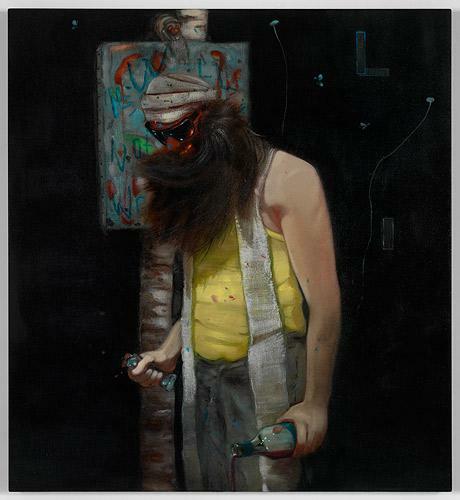 To cap it all, the works are all loosely within the genre of portraiture; the jerk himself looks out dumbstruck, struggling against the barrage of ambivalence and doubt that the works mobilize at his expense. Through an over-investment in pictorial signature (which in another time would have ultimately expunged the figure and led to abstraction), in these works the "sitter," or "figure" is still stuck in there anyway, lingering like a squatting tenant after the eviction notice has long been served. The ambivalence of these works – the need to both embrace and assault the mechanisms of figurative art – brings the artists right to the centre of their representations. The "portrait" is not so much of the figure as of the artist's attitude towards it; the "Jerk" is therefore a mobile value in the show, becoming the personification of intellectual doubt, a visual alter-ego, or the recipient of a troubling and formless contempt. These often grotesque images and styles harbor an undercurrent of disgust and ridicule, an attempt to humiliate the grandiosity of the portrait with a "thinking" stupidity which takes the place of good intentions, visual mimesis and human empathy. Stupidity is here used as a tone of voice, and as a state of mind, to draw new questions about the cloying funk of sophistication that routinely blocks real engagement with art. In the work of these artists, materials and representation are deployed perversely to call upon our phobia of stupidity, and our banal need for it to be vanquished by conventions of order and good manners. 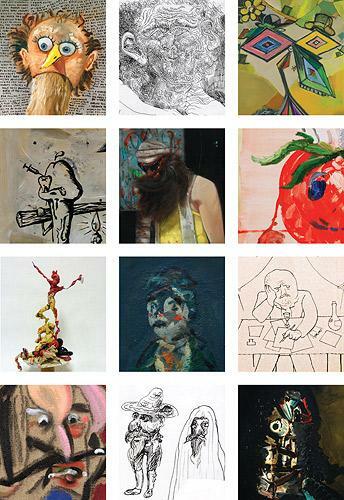 In different ways the artists follow a tradition of the "Fool" that is more familiar in the written word, starting perhaps with Rousseau, Hölderlin and Dostoyevsky, and then continuing through Nietzsche, Conrad, Rilke, Walter Benjamin, and Sartre. It is a tradition where failure, ignorance and thoughtlessness are not straightforward, often enfolding their opposite value in a critical and volatile relationship with arbitrary social structures – the stuff that creates taste and decency, and, ultimately, a culture of bourgeois and uncritical "art appreciation." This is a take on stupidity that positions it as central to all creative projects, and for this reason its value is not merely negative. As a rigorous ingredient it becomes a remainder that cannot be assimilated by taste, yet is vital to the complexity of artistic production. It could be suggested that Picasso's late portraits, with their emphasis on the "thoughtless" (unpremeditated) creativity of children, carried this tradition into the visual most conspicuously with their goofy, outlandish physiognomies. They brought this conception of thoughtlessness – and by association stupidity – into the centre of representation as a very real question. In this spirit the show plots a nano-tradition within the vast history of figurative art, a line of visual thinking that is still developing today. 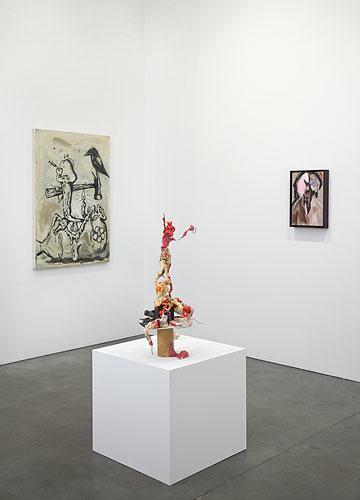 Andrea Rosen Gallery is delighted to announce the second in a series of exhibitions curated by the gallery's artists in which they were asked to contextualize their work. Nigel Cooke (b. 1973, Manchester, UK) holds an M.A. from the Royal College of Art and a Ph.D. from Goldsmith's College, London, and now lives and works in Kent. 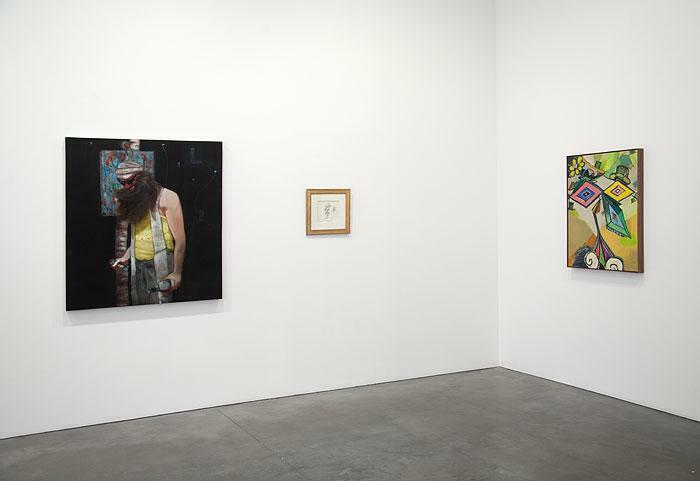 Nigel's third solo exhibition at Andrea Rosen Gallery was in April 2009. He was recently included in "Skin Fruit: Selections from the Dakis Joannou Collection," curated by Jeff Koons at the New Museum of Contemporary Art, New York, and will have forthcoming solo exhibitions at Stuart Shave Modern Art, London, and Blum & Poe, Los Angeles. He has also shown at Tate Britain and at the South London Gallery. His work is in the collections of the Tate, the MoMA, the Guggenheim Museum, the UCLA Hammer Museum and LA MoCA among others. 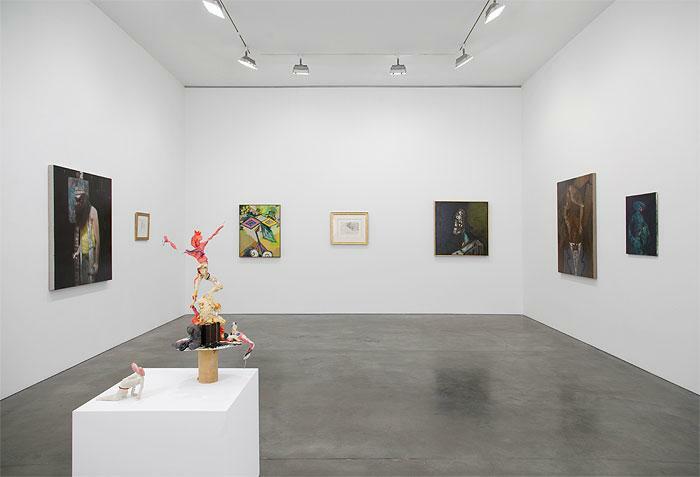 For press information and images, please contact Jessica Eckert, j.eckert@rosengallery.com, or Renee Reyes, r.reyes@rosengallery.com.